The Spiderwick Chronicles is a best-selling book series by Holly Black and Tony DiTerlizzi in which twin brothers Jared and Simon, along with their sister Mallory Grace, embark on a perilous journey filled with adventure and danger. 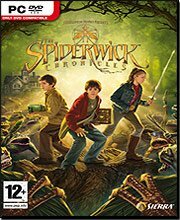 The Spiderwick Chronicles PC game features multiple playable characters, each with unique abilities. Unlock and explore the hidden world of the seen and unseen from the Spiderwick Chronicles movie. Battle strange and enchanted creatures in this spellbound world of eerie adventures as you fight to stop a rising evil.